This spectrum captured by the Mars Exploration Rover Opportunity's mini-thermal emission spectrometer shows the presence of grey hematite in the martian soil at Meridiani Planum, Mars. On Earth, hematite forms in the presence of water, at the bottom of lakes, springs and other bodies of standing water. But it can also arise without water in volcanic regions. Scientists hope to discover the origins of martian hematite with the help of Opportunity's robotic set of geological tools. 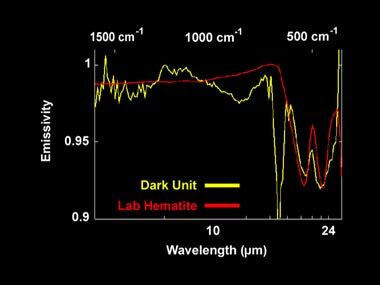 The yellow line represents the spectrum, or light signature, of the martian soil, while the red line shows the spectrum of pure hematite.